Taking the First Hull of the North Pacific 44 Sedan for a Spin. 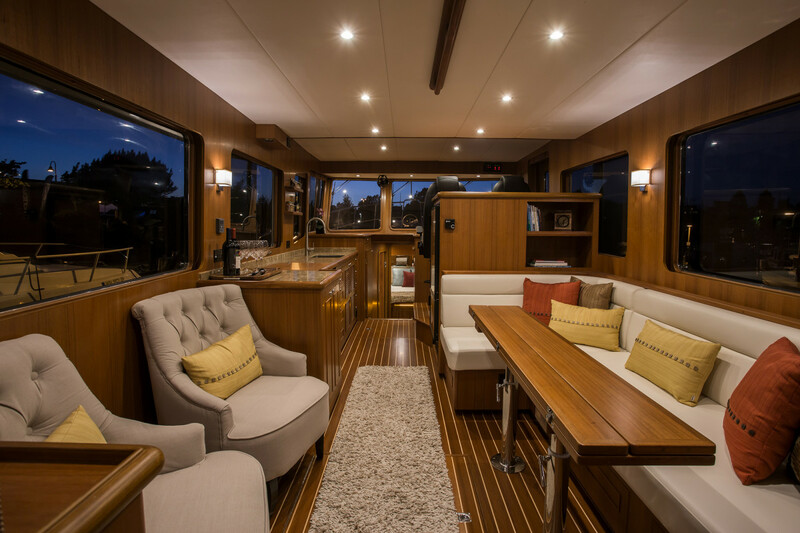 During this year’s Bremerton TrawlerFest I got the full tour of the new North Pacific 44 Sedan from company owner, Trevor Brice. 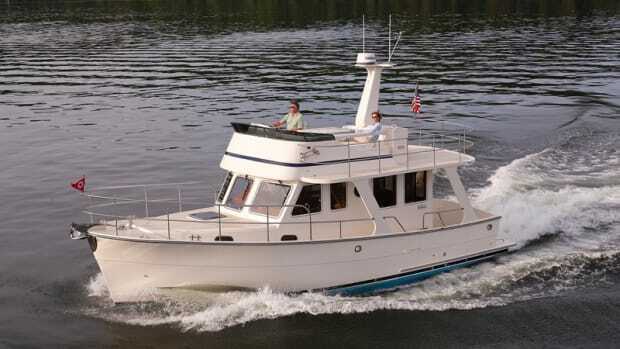 This was the U.S. debut for the new model that would soon be delivered to her new home in Bellingham, Washington. 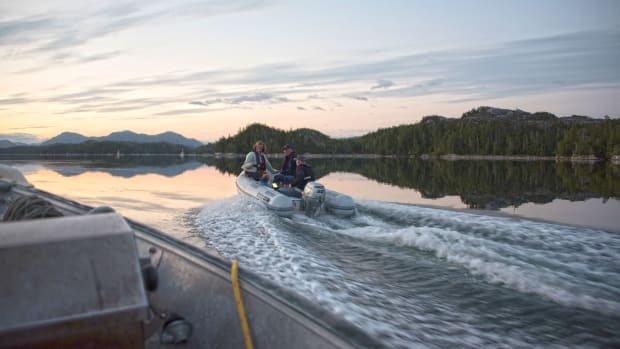 As the show closed Trevor suggested we take it out for a spin in Sinclair Inlet. The new owner hadn’t even had a chance to take her out yet, but my twinge of guilt subsided as we eased out of Bremerton’s marina and I throttled up the single Cummins diesel. A look at the forward deck of the North Pacific 44 Sedan. 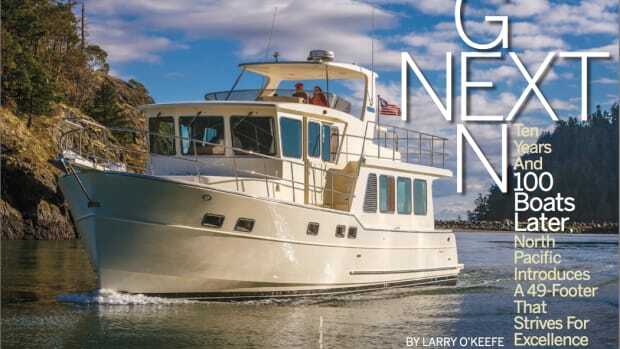 The owner, 87-year-old Walter Corbin, wasn’t exactly a new face to Trevor when he ordered the first hull in the new 44 series; Walt has already been cruising on a North Pacific 38 Sedan for a year. What’s more, he is no stranger to boat building, having owned, bought, and sold over half a dozen boats during his life. Walt’s story may sound familiar: a former sailor who wanted a more comfortable and drier cruising platform. After a summer of 38 ownership, Walt’s biggest complaint wasn’t about the boat at all, it was that he hadn’t used her enough. Between owning and managing an orchard, a saw mill, and a wood kiln, it left little time to get out on the water. 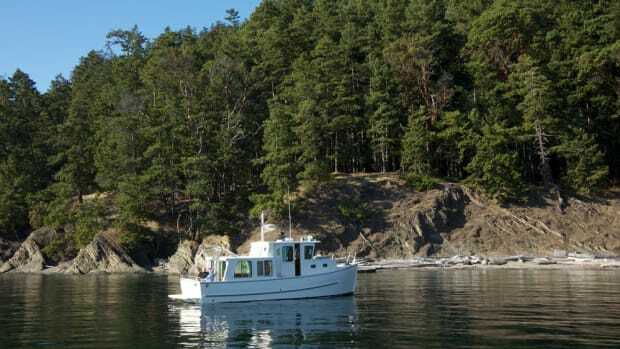 Despite his busy schedule, he still managed to make it up to Princess Louisa this summer as well as cruise around the San Juan Islands where he lives. I must admit, at 87, Walt Corbin puts plenty of people to shame with how hard he works and plays in his retirement. The saloon of the 44 Sedan is spacious and bright with large window surrounds. For those whose cruising is more focused on coastal than long-distance passages, the sedan style can be much more appealing. 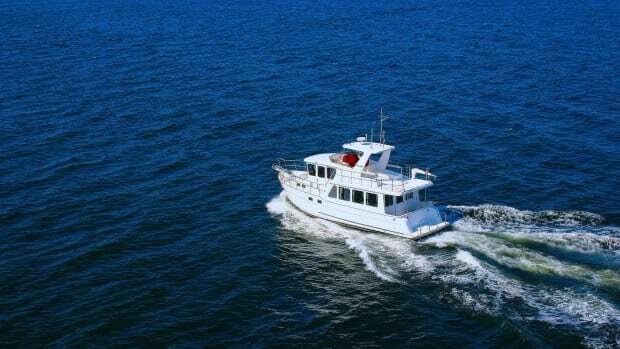 While the pilothouse is sacrificed, leading to the potential loss of some helm comfort and space, what is gained is a much more open concept that lends itself to entertaining and cruising with friends. This was one of Walt’s first comments about the boat, and clearly the open space appeals to both him and his wife, Gayle. That open concept is immediately felt aboard the North Pacific 44. Entering from the aft deck into the saloon, you can see all the way forward to the helm seats along the starboard side. This affords a spacious saloon area aft, with a large dinette opposed by a comfortable pair of chairs. Moving forward in the saloon there is a straight galley along the port side with a large refrigerator opposing it to starboard. Forward of the refrigerator cabinet there is a slight step up to the helm, which actually gives the feeling of a quasi-pilothouse. The helm itself sports two comfortable helm seats that allow for a companion while underway, which I thought felt nice for longer passages endured by couples when there is often a single, lonely, helm seat. 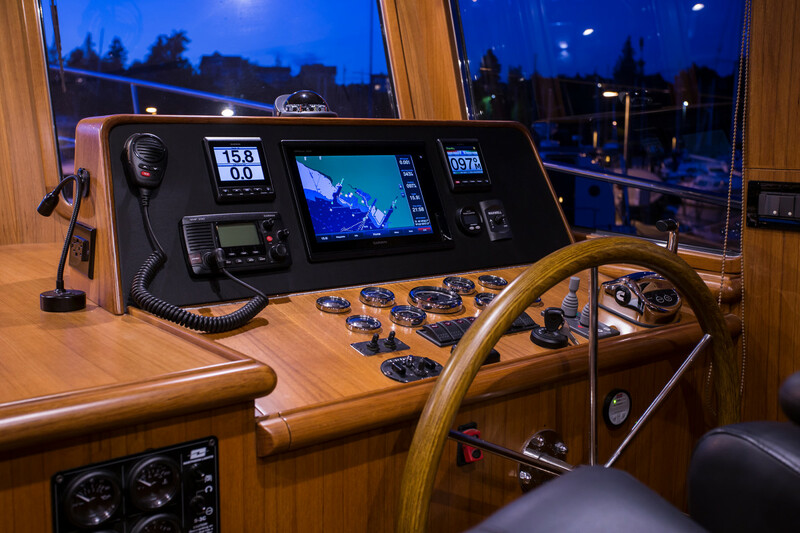 The helm station itself was well laid out with a bevy of Garmin electronics and Cummins engine gauges. 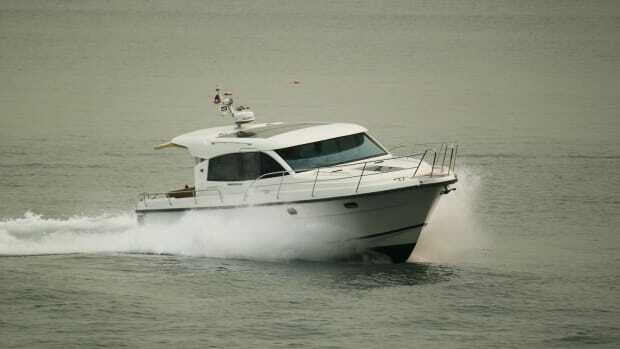 While this Sedan style 44 lacks a pilothouse, this helm station provides an additional seat for a companion. 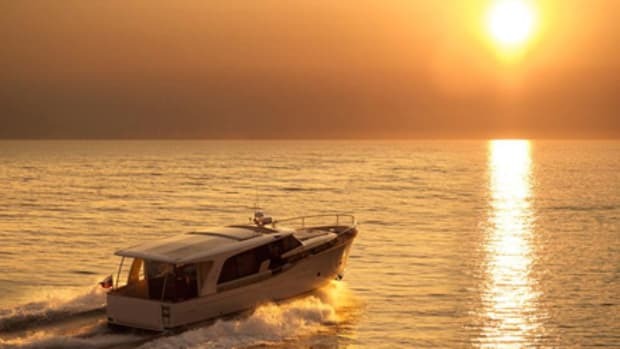 The benefit of a saloon-style boat are the great sight lines that are afforded when backing up and docking. The operator can easily see down the starboard side of the boat through a sliding door that exits the helm area to the walk-around decks. And the bounty of saloon windows allows the captain to look aft windows as well as see down the port side of the vessel with little obstruction. The visibility from the offset helm, looking forward, was just okay. Aboard hull number one, a forward deck seat backrest obscures the view over the bow, but Trevor indicated that a redesign of this was already being applied to future hulls and a fix was underway for Walt’s boat. The master stateroom features an island queen sized bed and an abundance headroom. At the front end of the saloon, a short staircase takes you below to the two cabins aboard this 44. Along the starboard side below the helm sits the guest stateroom featuring two twin beds. The forward master stateroom is large, with a queen-sized island berth and huge headroom. The master sports good storage, with two hanging lockers on board the boat we tested. 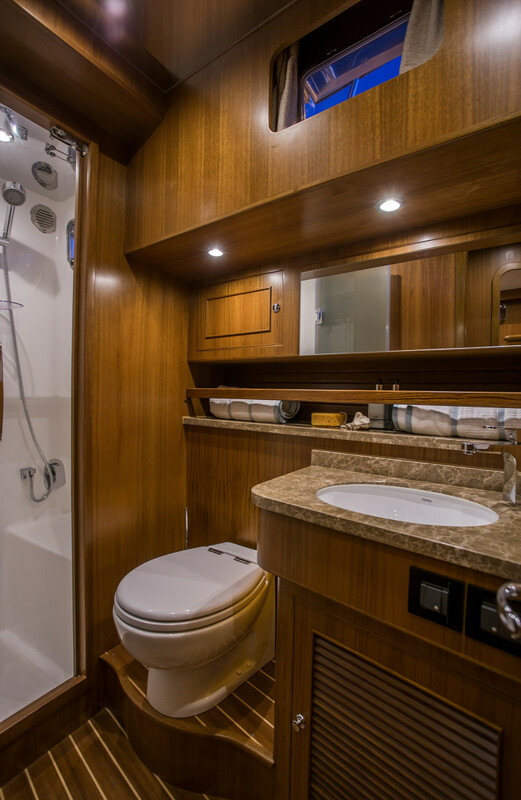 A door to the aft, port-side of the master leads to the large head that features a separate stall shower. In Jack ‘n Jill fashion, another door opens to allow users entrance to the head without transiting through the master—basically a requirement on a single-head boat. 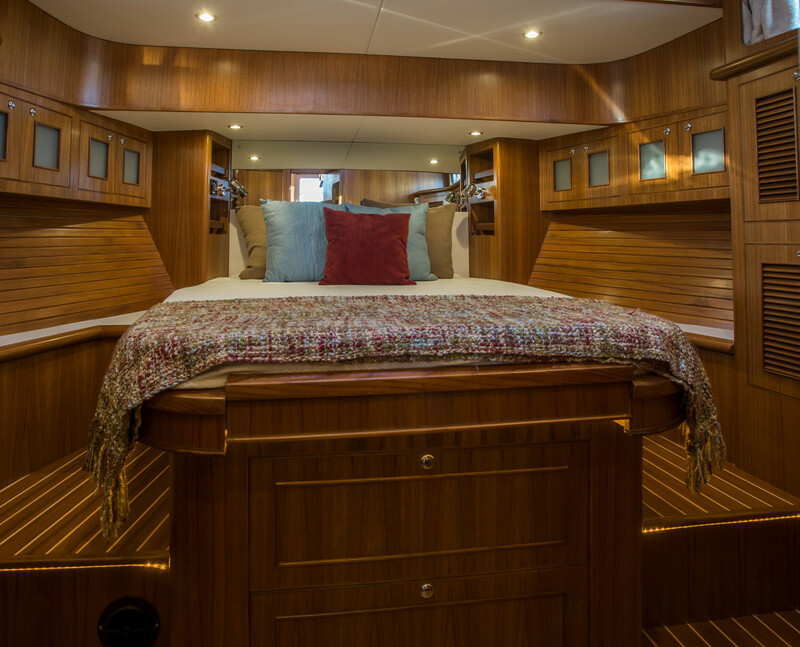 The spacious head allows access both from the companionway and the master stateroom. 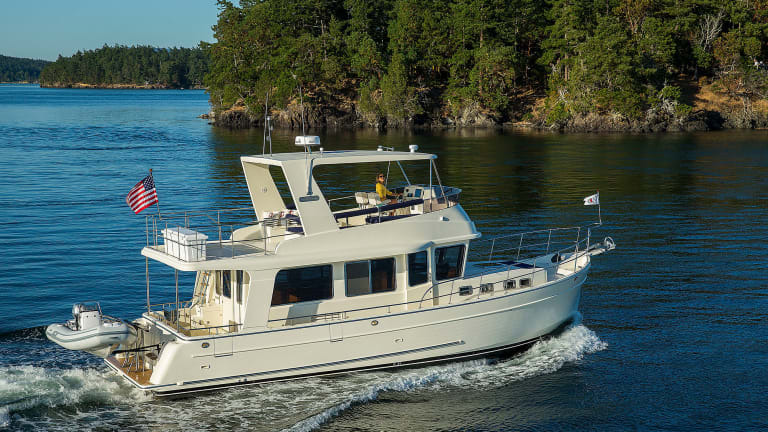 One of the great things about North Pacific Yachts is the variety of custom layouts they offer in each model. The 44 Sedan can be ordered with a two-head layout that allows for the guest stateroom to be replaced by an onboard office. Another interesting feature of North Pacific Yachts is that the boats come loaded with standard equipment, and are basically turn-key. 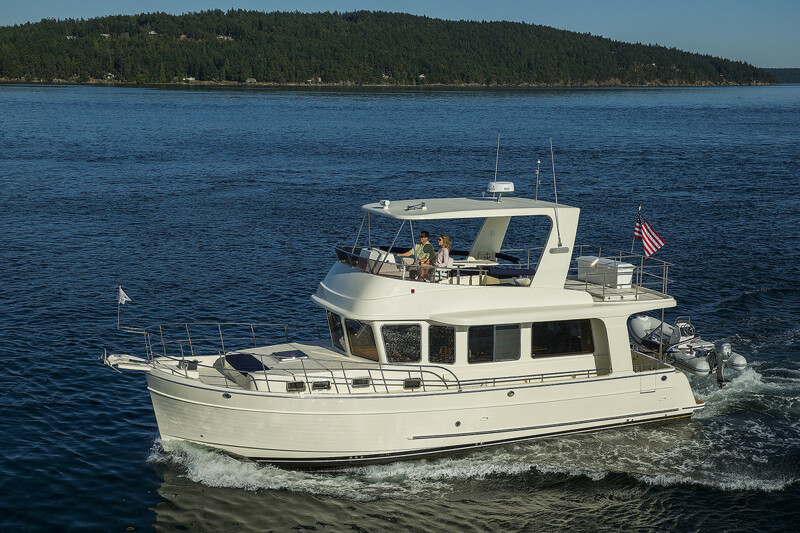 The North Pacific 44 Sedan sports some pleasing lines with her near flush-deck layout. She has a just slightly raked bow that cuts through the water nicely. 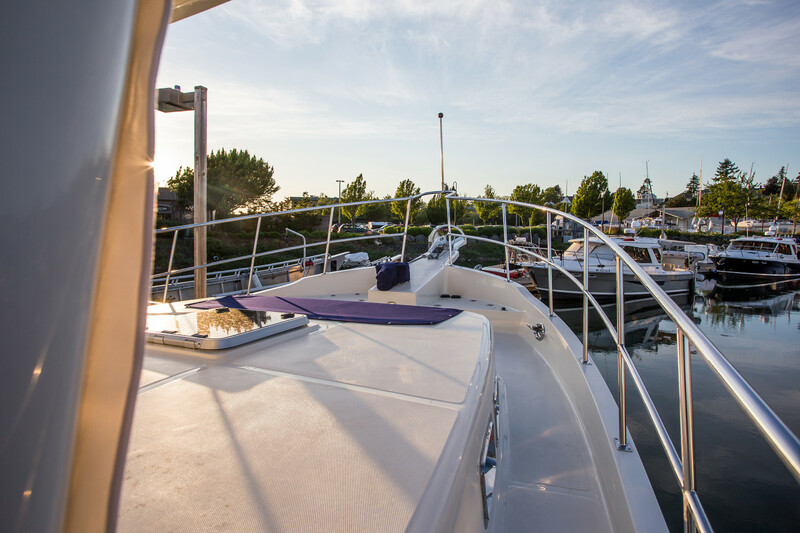 For those who like to spend time on deck, the swim platform is substantial, perfect for stern-in docking. Two storage lockers are built into the transom making for sufficient storage of lines, hoses, and electrical cords. 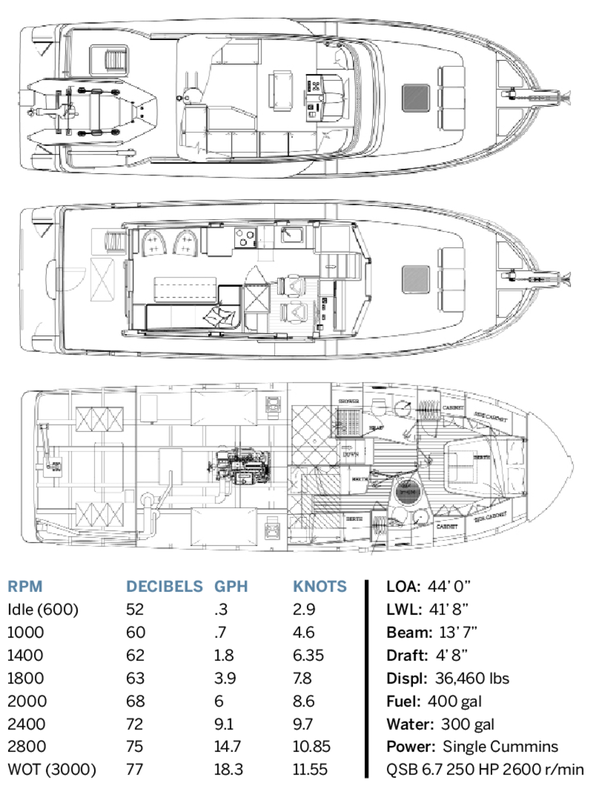 The aft deck is equipped with two side-boarding doors through the bulwarks for easy entry and exit. 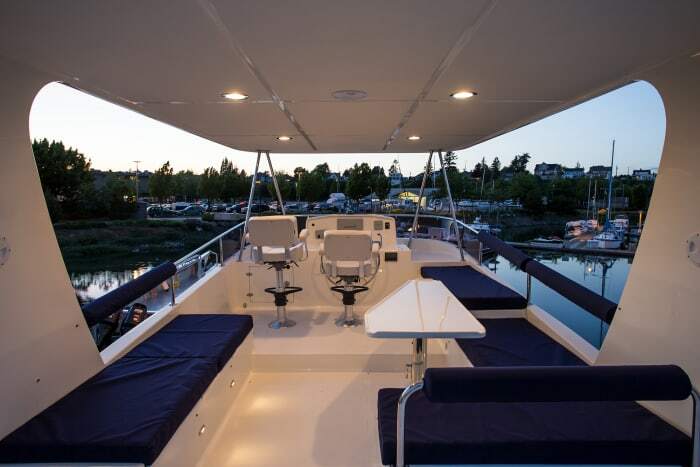 The side decks also make for easy transit fore and aft and there is ample seating up front for watching the sunset over a quiet anchorage. The North Pacific 44 Sedan underway. 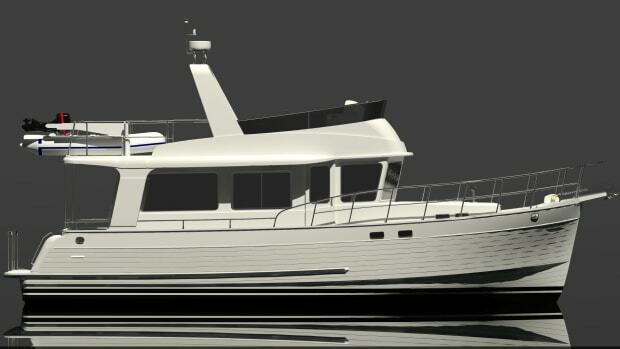 The flybridge is sized competitively for this market and suitable for hosting a group while operating at the upper helm station. A staircase on the starboard side of the cockpit leads you up to the bridge deck that includes a large seating area forward, adjacent the helm. Seating abounds here, with a double helm seat, seating for at least 10, and a dining table that could provide dinner for six adults. The aft area easily stores a dinghy and davit, although Walt prefers to hang his tender off the transom. Hull number one has a hardtop cover over the flybridge that I didn’t find overly appealing and added to some noise on the water. If I were ordering one of for myself I’d go without the hardtop, but that is a personal preference. The 44 Sedan is powered by a single Cummins 250 horsepower QSB 6.7 engine. 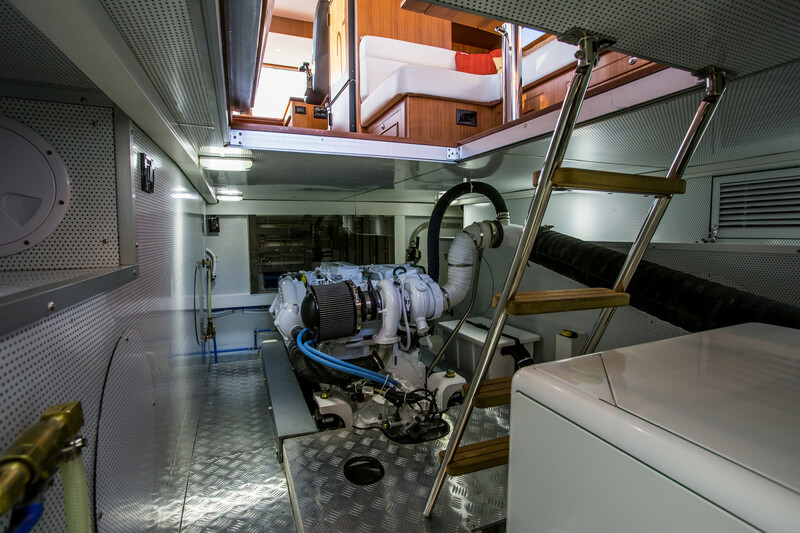 The engine room, which can be found under the saloon floor, is spacious, spotless, and well laid out. Engineers, or owners who don’t mind the mechanicals, will have the ability to get around both sides of the engine. The space also houses a Northern Lights generator that comes standard. Walt tells me that he is thrilled with the engine room, and that it compares favorably in size—and often exceeds—models in and above its class. The engine room, which can be found under the saloon floor, is spacious, spotless, and well laid out. While my test was relatively short, the 44 has pleasant running characteristics. At WOT, she cuts through the water with a very slight bow rise and visibility is unchanged. The 44S, with her single screw Cummins, was economical throughout her RPM range, feeling best at about 1800 rpm where she burned 3.9 gallons per hour running at 7.8 knots. After a summer of use Walt reports his sweet spot at 3.5 gallons per hour and 7 knots.